1 of 3 Heat oil in a large pot over medium-high heat. Add onions and peppers; cook 2 minutes, stirring occasionally. Add sausages; cook 3 minutes. 2 of 3 Stir in tomatoes, breaking up with a spoon. Add chicken broth, pinto beans, black beans, corn, chile powder, oregano and salt. Bring to a boil; lower heat and simmer, covered, 10 minutes. 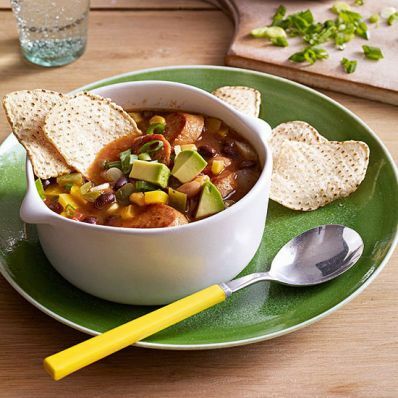 3 of 3 To serve, spoon into soup bowls; crush tortilla chips over each serving and top with scallion and avocado.